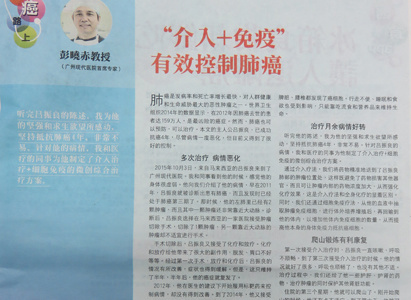 On December 23rd, 2015, Malaysia Guang Ming Daily published a special report, which introduced the anticancer story of lung cancer patient LER CHIN LIANG, whose condition turned better and cancer cells were under well controlled after taking interventional therapy and natural therapy in Modern Cancer Hospital Guangzhou. The morbidity and mortality of lung cancer grow fast, which makes lung cancer become a big threat to human health. According to the statistic of WHO in 2014, patients died because of lung cancer has reached 1, 5900,000 in 2012. Although lung cancer is terrible, it actually can be treated and prevented. On October 3rd, 2015, Malaysian lung cancer patient LER CHIN LIANG came to Modern Cancer Hospital Guangzhou. He was weak when we met him. LER CHIN LIANG told us that he was diagnosed with stage Ⅲ lung cancer in 2011. Examination results showed that there were two tumors in his lung. Later, he took resection operation to move one tumor in a Malaysian local hospital. However, the other tumor still remained in that it was too closed to the main artery. Except for operation, LER CHIN LIANG received chemotherapy and radiotherapy. To a certain extent, the great side effects brought by chemotherapy and radiotherapy, such as vomiting, hair losing, pain, etc, greatly tortured him. What’s worse, his tumor recurred half year later. LER CHIN LIANG tried many treatments during 2012 to 2015, such as taking targeted drug, radiofrequency ablation and chemotherapy, etc; his condition did not turn better but worse. Cancer cells metalized and spread to the whole body, cancer cells were found in his liver, spleen, lung and lumbar. LER CHIN LIANG took liquids and nourishment to maintain his life because he could no longer walk and had a bad appetite and sleeping. After knowing LER CHIN LIANG’s condition in detail, Professor Peng Xiaochi and the multidisciplinary team (MDT) of Modern Cancer Hospital Guangzhou specially made him a comprehensive therapeutic plan based on interventional therapy and natural therapy. Interventional therapy precisely transfused drugs to the tumor, which not only protects the normal tissues from the drug, but also improves the drug concentration and efficacy. Actually, that is the significant difference between interventional therapy and chemotherapy. LER CHIN LIANG also received natural therapy, which improves the immune cell number and patient’s immunity by culturing, proliferating patient’s own immune cells. Recalling his 4-year anticancer experience, LER CHIN LIANG’s condition was not stabilized. Now in Modern Cancer Hospital Guangzhou, his condition finally has been improved and the cancer cells were effectively controlled. Except for showing his gratitude to Modern Cancer Hospital Guangzhou, LER CHIN LIANG also wished other cancer patients to find a better cancer treatment and restore to health soon.